The Scotmid team before the start of Pedal for Scotland. "Pedal for Scotland is a great event that brings thousands of people from Scotland together." A team of nearly 40 from Scotmid Co-operative Society saddled up for Pedal for Scotland on Sunday 8 September. The cross-country cycling challenge, which is Scotland’s largest mass participation bike ride, saw more than 8,000 people pedal from Glasgow to Edinburgh. 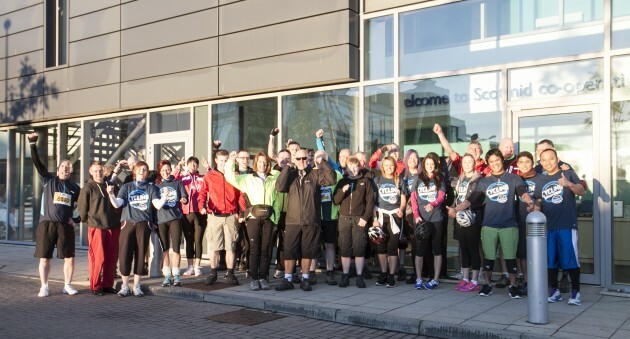 33 Scotmid team members completed the 47 mile cycle, including staff from Scotmid’s stores in Roseburn, Marchmont, Ferry Road, Leven Street and Gardenhall in Glasgow, as well as staff from Semichem, Scotmid Funeral branches and the Society’s head office. Three team members, Martin Devlin, Matthew Devlin and Jim Harper, took on the 110 mile sportive challenge through the Southern Uplands. Scotmid is one of the key sponsors of the event and ran the rest stop at Kirkliston, which is the last stop before the finish line at Murrayfield Stadium. Scotmid’s volunteers were on hand to provide free tea, coffee, bananas and snacks to cyclists, while the Preston Lodge High School Pipe Band performed at the event. Scotmid recently awarded sponsorship to the band to help fund new uniforms and equipment. 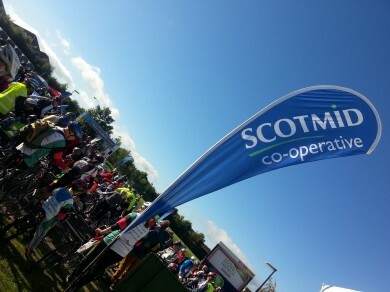 Scotmid sponsored the rest stop at Kirkliston. The team have raised nearly £2,000 so far for Prostate Cancer UK, the Society’s new charity partner and can be sponsored on their Justgiving page. Part of Team Scotmid were: Carrie Love, Jodie Forrest, Alison Morrow, Chris Vidler, Malcolm Brown, Isobel Brown, Sue Man, Max Callaghan, Allan Stonehouse, Grant Newman, Ann Harris, Carol Middleton, Neil Barrack, Gillian McFall, Kris Findlay-Higgins, David Milliken, Jonald Barrera, Deo Solis, Martin Devlin, Matthew Devlin, Jim Harper, Thomas Diamond, Paul Simpson, Christine Chitty, Gillian Harvey, James Blackburn, Lyndsey Harvey, Rab Waterson, Adrian Turner, Gavin Sinclair, Karen Blackburn, Iain Armstrong, David Lindsay, David Rees, Richard Arnott and Jamie Williams.